Let's be clear. I do not have a lot of tools. If I need a tool, I have to take the trek to the basement or the barn, go through the husband's tools and hopefully pick the right one to do the job. Sometimes it takes me quite a few trips to get the right one and that's frustrating! I don't need a lot of tools in my life, but when I do, I want something handy right away. 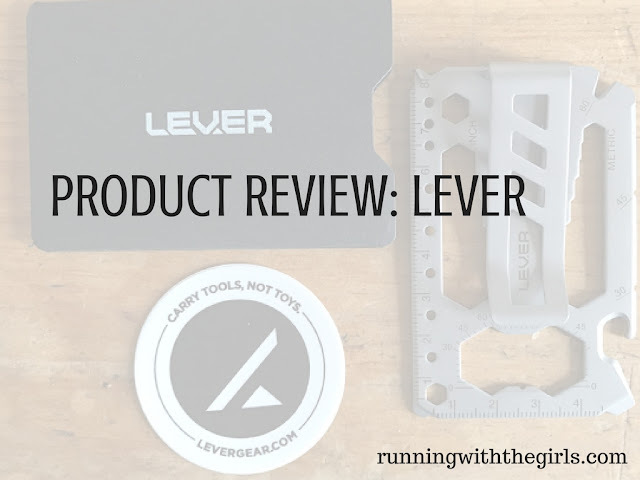 Which is why I like the LEVER Gear Toolcard. This 1 card has 40 tools and hundreds of uses! I haven't needed to use it for most of the uses listed above but I'm sure I'll need it for a lot of those uses eventually. I like to tuck it into the front pocket of my "wallet" and I have it with me whenever I need it! I really like having my own "set of tools" in one handy little device. With all of that running I do, my joints take a beating! I want them to stay happy for a LONG time, as I plan on being here for a LONG time! With the TCS New York City Marathon just around the corner for me, I have maybe be obsessed with the infographics. This one is one of my favorites. I know many people who run far more than that per week in a training cycle, but let's just look at this. If the average runner does run 34 miles per week, how many steps does a person take per mile? This question really depends on the runner, their stride, their pace, and so many other factors. But let's just say, for fun, that the average runner takes 1760 steps per mile. That's nearly 60,000 steps in a training week. Now, depending on body type/weight/form and a whole lot of other factors, imagine the amount of impact those steps have on your bones and joints. It kind of makes me hurt just thinking about it. It's the moments we get with our loved ones, the smiles, the laughter, the hug, the special look, the "I love you's" that mean the most. It's those moments that you cherish and reflect on when things get crazy. At least, that's what I do. When everything seems like there's no winning, there's no way out, I stop and look around and think about those precious moments that got me to where I am. And I remember that I have so much to be thankful for. It all comes down to time is precious. Time with your loved ones. Time at the game, watching your boy do the thing he loves. Time on the town dock, with the kids, enjoying a gorgeous night. If I could just go back in time to hug my mom one more time. And hold on to her tight and never let go. Just one more time. When I stop and smell the roses and take in the precious people and moments in my life, I know I'm the lucky one. It's been 3 weeks since I ran Clarence DeMar..... and I run THEY New York City Marathon in 3 weeks. I *might* be freaking out a little bit! Just a tiny bit. I mean, I'm going from 300 people to 50,000. Yeah... all of those zeros. CRAZY! Maine girl right here, going to big city NYC. I know for one thing, it's going to be experience! I'm nearly done with my fundraising... my Paint Night fundraiser is tomorrow night, then I'll add the $ from both Paint Nights to my account and done! But I feel like I want to do one more little fundraiser. Just that added push! And since the deadline for the fundraiser is Monday! EEEK! I am going to squeeze in a FLASH raffle/giveaway on my blog! The marathon is a very humbling experience. You train for it for months. It's seriously like a second job. You practice race day fueling and hydration each time you do a long run. You crush your workouts and go into a race feeling strong and confident. For me, sometimes the end result is a PR. Sometimes it's not even close to a PR. It's a challenging distance that's for sure and a lot can happen over the course of 26.2 (or so) miles. I've been wanting to do the Clarence DeMar marathon for a few years now. The gorgeous setting, the downhill elevation profile. That combination seemed perfect for me! Last weekend, the husband, brother-in-law, sister-in-law, a friend of ours, and myself loaded up our cars and headed to Keene, NH for the big day. We picked up our packets, checked into our cabin, then went out for dinner. It was relaxing day. Fall is HERE! While I love the crisp cool air, the gorgeous colors as the leaves change, all of the pumpkin and my fall marathons. It's sad to see the daylight hours getting shorter and shorter. There just isn't enough time in the day! Which leaves us runners with less time to get our run done during daylight. That's why RunLites are amazing! I'm normally not one to run at night. Especially long distances. However, I will go out for a shorter distance at night. There is something about the fresh air and a run after a long day that is quite relaxing. I admit it. I am nervous about running at night. I need to know that I will be seen by an oncoming car AND I need to know that I can see where I'm going. RunLites are amazing. I get tired of carrying things on my runs.